Vision, not Santa Cruz, on the back of R.a.D magazine? These were strange days. No idea what was going on there. Interesting to see that one of the pictures is by David Walsh and another by Dan Sturt. Vision’s history would be fascinating to read. This must have been around the time of the peak, complete with the monster warehouse the size of a block. They touched on the development of R.a.d on various occasions, but always in a very oblique way. At Alpine Sports I can remember Pete Collins coming back from California with stories about buying stuff from a distributor who seemed to be very into Britain and drove some British sports car. Brad’s sister ran the Mad Rats brand which was one of the first small labels we brought over (I still use one of the bags). Steve Douglas and Schmitt began their business relationship beneath the Vision umbrella. At a critical period they provided home and employment for the legendary Dave Currey. And of course, for a long time there was Mark Gonzales, whose skating and approach to life were a deep influence on the magazine. Nice comments… thanks. Marty Jimenez (“Jinx”) and Greg Evans built that Vision Street Wear grey shoe ad featuring Gator and Eric Nash. I was the creative director at Vision Street Wear from 85 through 1991 (when I left to start “Simple” shoes. It was an amazing time. 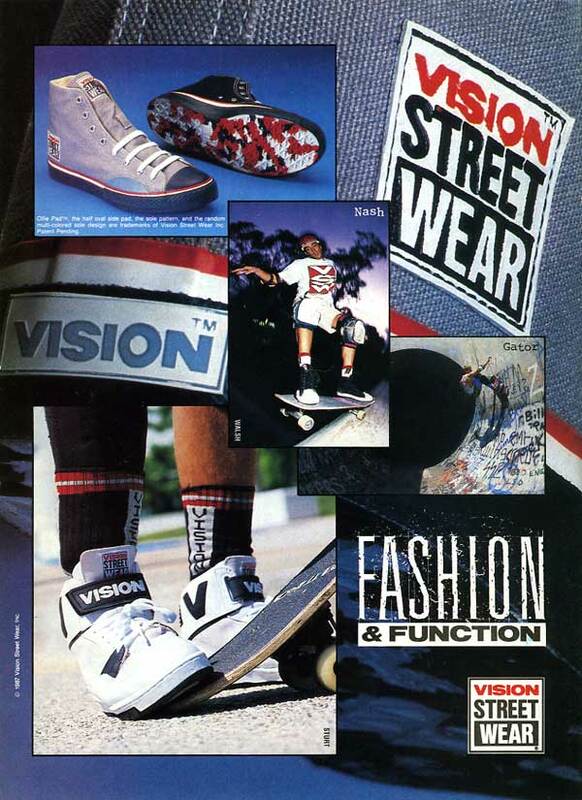 At the time Vision was on the leading edge… skate clothing style evolved before our eyes. So many cool skaters and artists had such and influence. John Grigley, Andy Takakgian, Gregory Bevinginton (psychoman), Marty Jimenez, Shark, Greg Evans (created the VSW logo and was art director) Dave Petri (later started Split), Dan Sweet. A few standouts… Mike Genera… was an incredible artists… but really hard to keep at work! Same goes for Dave Curry and Mark Gonzales… amazing artists. Madrats was the beginning… but the pads were pretty dumb and nobody used them. Peter Schroff had “Schroff Design”… but then Gotcha created “Bash”… and stole Peter Schroff from his own brand. Bash was a cool line… I don’t know why Gotcha quickly canned it. Schroff Design and Stussy I think were the originals of the action sports clothing evolution away from specific surf fashion and towards street fashion. VSW focussed on a specific “skate” look within this new graphic street style. We take skate style for granted now… but prior to the early 1980’s… it didn’t really exist. Skaters looked like surfers before that.